October brings lots of colour, fabulous autumnal produce and Halloween of course. All are reflected here in these 8 tempting chocolate recipes. The cold weather gives an excellent excuse to indulge, so take a look. You may end up craving chocolate, but there are some surprising healthy options. If you’d like to join in with next month’s #WeShouldCocoa, scroll down to the bottom of the post and you’ll find the November link-up. If you haven’t joined in before or need a reminder, you can find the guidelines on the We Should Cocoa page. Proper Foodie kicks things off with one of CT’s favourite desserts. The best Tiramisu is an Italian classic transformed into individual glasses of scrumptiousness. You can’t have an October round-up without a pumpkin recipe or two. These dairy free pumpkin brownies from Every Day Healthy Recipes are low in both sugar and saturated fat. If there’s one thing I can’t resist, it’s chocolate tiffin and the like. Baking Queen has stolen my heart with what she says is the easiest rocky road. Now here’s one for the cold weather and it’s rather healthy too. Hot coco from Where The Wild Rose Grows. It’s made with carob and homemade coconut milk and is Paleo, AIP and vegan. It may not be the weather for ice-cream here, but it sounds like it might be in the Southern hemisphere. This outrageous ice-cream sundae from Green Gourmet Giraffe is made with homemade baked vegan doughnuts with salted caramel ice-cream, chocolate sauce, salted caramel sauce, fresh berries, chocolate sprinkles, chocolate wafers and I want one. Now for something a little bit more spooky. Mummy eclairs made with white chocolate and chocolate choux bats made with milk chocolate from Mummy Mishaps. If you want a stunning free-from celebration cake, this mocha cake from The Gluten Free Alchemist could be the one for you. It’s not only gluten-free but also nut-free, rice-free and optionally dairy-free too. I also made hot chocolate for this month’s #WeShouldCocoa, though I went dairy all the way with this one. I may have added some marshmallow fluff too. 8 Tempting Chocolate Recipes. PIN IT. Lovely round up! I just love those chocolate choux bats as I know my children would love them. They’re brilliant aren’t they. I’m not at all creative when it comes to themes, but I do like to see what others come up with. Hello Made yourhemp milk hot chocolate yesterday and it was fab! It’s nice to see chocolate being used in so many different ways. This roundup looks really delicious. the gf cake especially looks sensational! Shared. Thanks Monika. I always look forward to seeing what you all come up with. Hahaha, I remember Melbourne weather being as unpredictable as home. Better get those hot chocolates on before the ice cream sundae weather comes back. Gorgeous recipes! Love the cute bats for Halloween, and that mocha cake looks heavenly. Yes, everything looks so good. It always does. Food bloggers are amazing 🙂 I’m currently trying to figure out what to make for this month. Doing the #WeShouldCocoa round-up is always a pleasure and I always look forward to your contribution Kate. 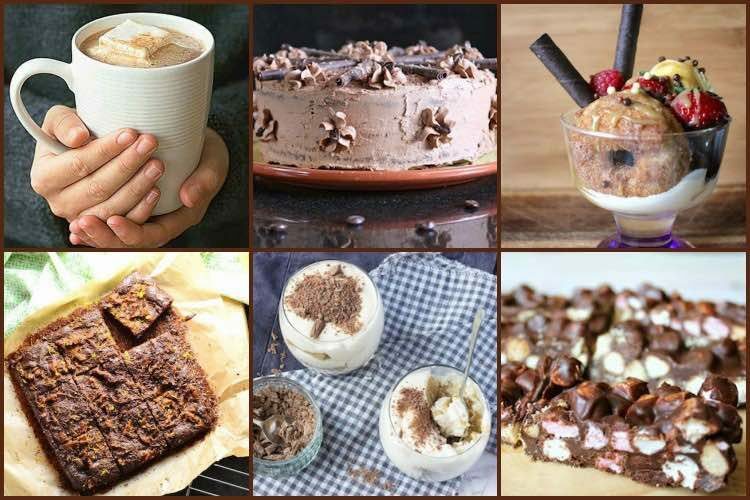 Oh my goodness, what a lovely round up of delicious looking chocolate recipes! A fab collection as always! I love seeing what everyone creates although it really does make me hungry!